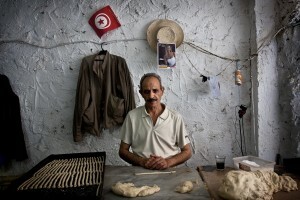 The work "Tunisians" is a survey of Tunisia, two years after the Jasmine Revolution. A country in transition, still immature to deal with a real democracy. An immaturity coming from the long dictatorship due to the resigned President Ben Alì. Tunisia today is a country full of contradictions, where hardly a plurality of religions coexists, and where the main one, the Islam, wants to interweave more and more powerfully with politics and doesn’ t want to open up a more "Western” mentality. On the one hand, the fringe Salafist calls for a reassessment of women’s role in society and against restrictive measures such as the prohibition of alcohol consumption. The figure of woman is always not so important. A large portion of the female population wears the veil even if doesn’t share its inherent sense and has a marginal role within the family. From the other hand, the new generation of adolescents shows a more advanced mentality than the older generations. 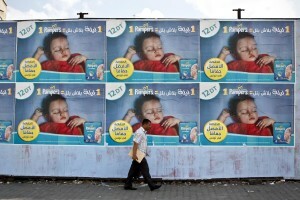 A mentality stemming from having lived on important days such as the Jasmine Revolution. Young Tunisians aspire to an economically efficient country and to the creation of new job opportunities. They show a vitality that only a few years ago would have been unimaginable. They study, they want to be competitive and dream of working in Europe. 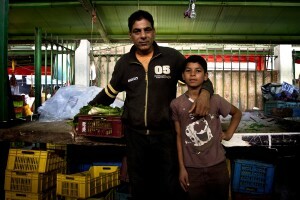 Despite the good wishes, after the resignation of dictator Ben Alì, the persistent poverty and prices’ increasing have affected the way Tunisians perceive revolution, which broke out by the other, due to economic problems. Tunisia has managed to do amazing things when it started up the revolution. Today the country is discovering step by step democracy and freedom in its various facets, with all the risks that this entails and entailed, as the dozens of lives that have gone off in order to get these important goals. 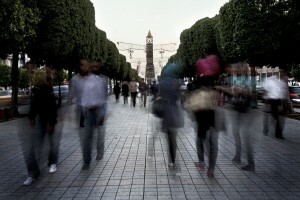 A group of people walking on Avenue Bourguiba, the road that was the scene of the Revolution of 2010-2011 in Tunis on October 17, 2012. 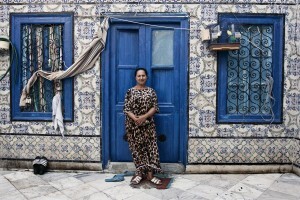 The portrait of a woman in front of the entrance of his house in the medina of Halfaouine in Tunis on October 10, 2012. 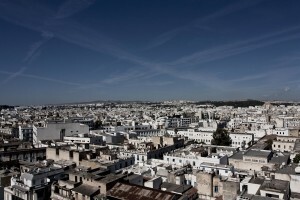 A general view of Tunis city center on October 18, 2012. 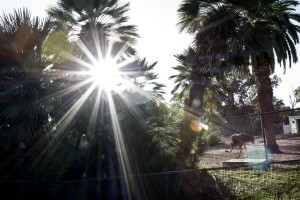 A man photographs two women near large turtles inside the “Parc du Belvedere” in Tunis on October 16, 2012. 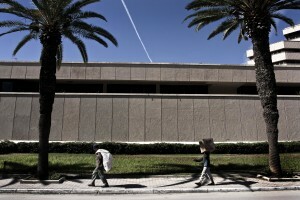 Two workers carrying goods along Avenue Mohamed V in Tunis on October 18, 2012. 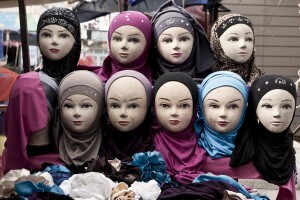 A stand of tunisian medina shows colored veils on October 21, 2012. 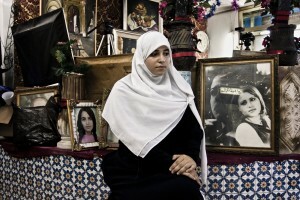 In Tunisia, as in every Muslim country, almost all women wear the veil. 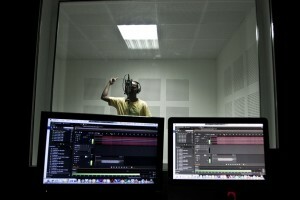 Students follow a lesson at University “La Monouba” in Tunis on October 17, 2012. 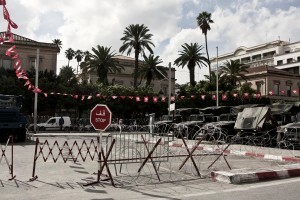 The French embassy in Tunis on October 19, 2012 protected by military tanks and barbed wire, following the publication of cartoons against the prophet Muhammad by French magazine Charlie Hebdo, in September 2012. 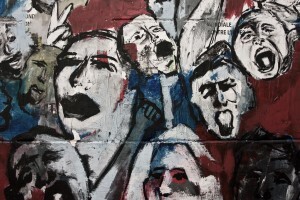 A mural on a wall in memory of the days of the revolution, which led to the end of the dictatorship of Ben Ali in Tunis on October 21, 2012. 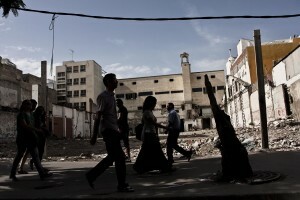 People walking along Avenue de Carthage in Tunis on October 20, 2012. 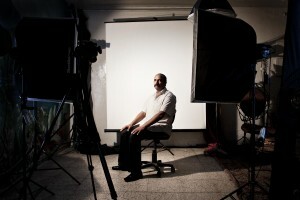 Ezzeddine (47 years) inside of a photo studio posing for his photo-card in Tunis on October 12, 2012. 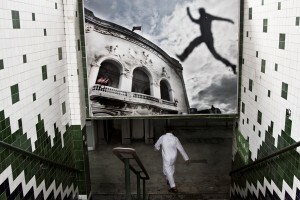 A man goes down in the Metropolitan tunnel of Place de la Republique, in the heart of Tunis on October 15, 2012. 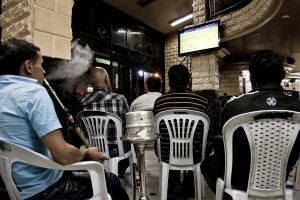 People smoke hookah and watching a football match inside a bar of Tunis on October 16, 2012. 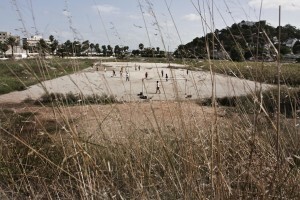 Some kids playing football in a soccer field near the port of Tunis on October 20, 2012. 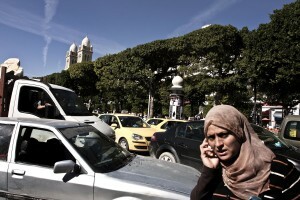 A woman talking on the phone while walking through the traffic of Avenue Bourguiba in Tunis on October 18, 2012. 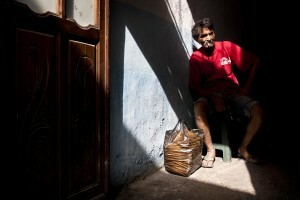 A portrait of the Tunisian rapper Karim Brik in Tunis on October 18, 2012. 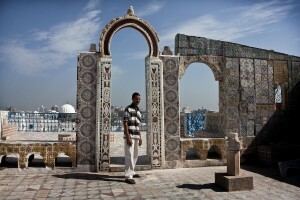 Karim became famous after the arrest of his brother Hassan (leader of the Salafi organization Ansar al Sharia), for violent attacks to US embassy in Tunis in September 14, 2012 against webcasting of the film anti-Mohammed. Sirine (18 years) portrayed in the photo studio where he works as a secretary in Tunis on October 12, 2012. 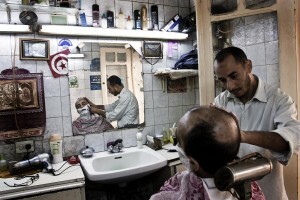 A man in a salon shaving in the heart of the old city in Tunis on October 21, 2012. 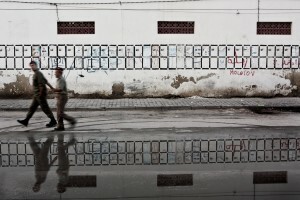 Two soldiers walking near the gate of Bab El Khadhra in Tunis on October 16, 2012. 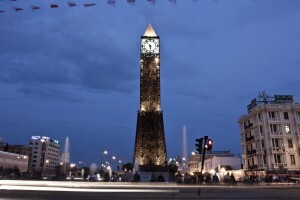 The clock of January 14 square became the symbol of the city after the revolutionary movements of January 2011 in Tunis on October 21, 2012.